(Leah Hogsten | Tribune file photo) Utah Transit Authority bus riders wait out the rain in shelters along 200 North in Farmington earlier this month. 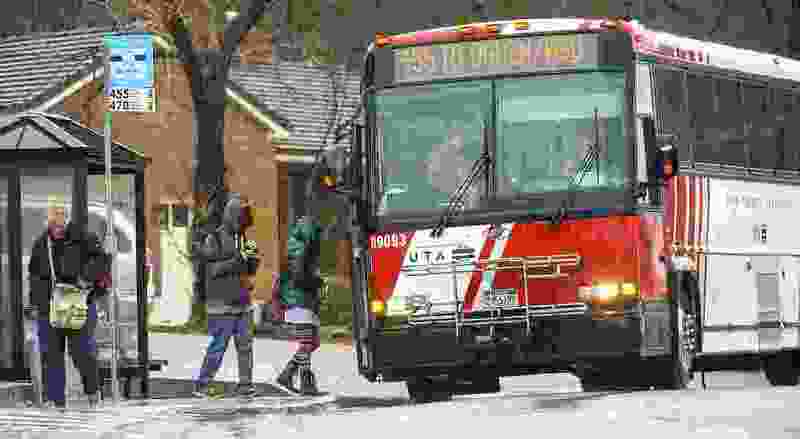 The Utah Transit Authority found a quick way to increase ridership: Offer free fares throughout its bus and train system. UTA and partners offered free-fare days Feb. 28 and March 1, a Thursday and Friday. Interim Executive Director Steve Meyer told the UTA board Wednesday that free rides attracted an extra 20,000 passengers the first day and 29,000 on the second. UTA estimates the free fares removed about 10,500 vehicles from the road each day, and each day prevented more than 2.5 tons of pollutants and 80 tons of greenhouse gases. But it was a bit less successful than the last time UTA offered a free-fare day two years ago — when ridership rose by 23 percent. Officials have said that higher rate might have occurred because that happened near Christmas, when many people used the UTA system to look at holiday decorations in downtown Salt Lake City. Meyer said he overheard a bus rider Wednesday telling another passenger that he tried UTA on the free-fare day and decided to keep riding because of it. The Legislature this year just created a pilot program to create more free-fare days in the future as an experiment to reduce air pollution. The final version of the bill provided $500,000, which would fund about seven free-fare days. UTA estimates that each one costs it about $70,000 in lost cash fares. An earlier version of the legislation had proposed $1.2 million to fund 17 free-fare days over three years. Unlike the two free-fare days that UTA just offered — which occurred on relatively clean air days — the future ones would be triggered by forecasts of an inversion. UTA and the Utah Division of Air Quality will measure how many vehicles are likely removed from the road and the effect on the air — and help see if more free-fare days should be considered in the future. Some bus systems in Utah — in Park City and Cache County — already offer free fares at all times. UTA has been offering it, thanks to a federal grant, on its new Utah Valley Express bus rapid transit system in Provo and Orem. The agency has said that has quintupled ridership from the old bus routes that it replaced. The recent free-fare days were funded by $80,000 contributed by Salt Lake City, Salt Lake County, Davis County and Intermountain Healthcare. UTA also contributed by giving up an estimated $60,000 in lost fares.